After evacuating Anandpur, Sri Guru Gobind Singh Ji preceded towards Ropar. He soon learnt that a large Muslim army lay a few miles in front. He knew that the armies of the two viceroys and the hill-chiefs were pursuing him. He was thus between two formidable armies. He had only forty Sikhs and his two elder sons with him. He decided to change his course and go to Chamkaur. On reaching there, he occupied a mud-built house or haveli. It was located on a high spot and was in the shape of a fort. He posted soldiers to guard the four walls and the gate. With two Sikhs and his two sons, he held the top storey. The Mughal armies arrived at nightfall. They surrounded the village. Early next day they began their attacks on the haveli. They were greeted, each time, with a volley of bullets and arrows. Each time they fell back after losing many of their soldiers. Two army officers, Nahar Khan and Gairat Khan, tried, in turn, to scale the wall of the haveli. They were cut down by the Guru. Another officer, Mahmud Khan, saved himself from the Guru's arrows by hiding behind a wall. The imperial army then decided to direct all their efforts towards-forcing to open the gate. 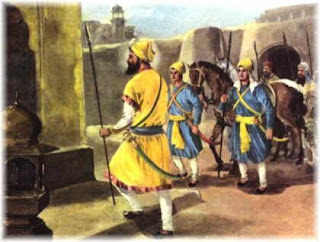 As they moved in that direction, a number of Sikhs went out to oppose them and defend the gate. They fought most valiantly and killed many of the attackers. At last, they were overpowered and slain. Then another batch of Sikhs came out and bravely engaged the attacker as long as they could. This went on for a good part of the day. Then there was a slight pause. The Sikhs met and decided to request and prevail upon the Guru to make good his escape. 'If he goes,'said they, 'he can raise thousands to carry on the fight for sacred cause.' So they approached him to make the request. They found that the Guru's eldest son, Baba Ajit Singh, was standing, with folded hands before him. He was begging permission to go out and check the enemy's advance in the next attack, which was sure to come soon. The Guru embraced and kissed his son for the last time. He then let him go into certain death. 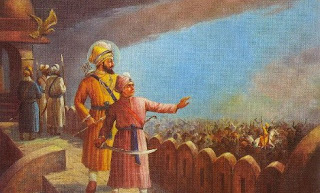 The Sikhs fell on their knees before the Guru and begged him to save himself and his two sons. But the Guru did not agree to do so. Every father wants to see their child get married, but this was the time of fighting the enemy. Death was waiting and today Baba Ajeet Singh would be marrying death. Baba Ajit Singh, who was hardly eighteen said farewell to his father, his younger brother, and his brother Sikhs. Five Sikhs accompanied him. The attackers came on. They were engaged by Baba Ajit Singh and his eight companions. Many of the attackers were cut down. At last, the nine brave warriors were overcome and killed. The Guru had been watching his son from the top storey, and admiring and rejoicing at his daring bravery and skill as a warrior. When he saw him fall, he thanked God that his son had proved worthy of His cause. 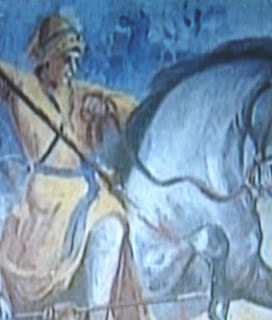 When Baba Ajit Singh Ji attained Shaheedi, Guru Sahib roared a Jaikara of "Sat Siree Akal." The Guru's second son, Baba Jujhar Singh now made the same request as his elder brother had made. "Permit me, dear father, to go where my brother has gone. Don't say that I am too young. I am your son. I am a Singh, a Lion, of yours. I shall prove worthy of you. I shall die fighting, with my face towards the enemy, with the Naam on my lips and the Guru in my heart." Thus armed, this lad of fourteen years went out to face thousands of hard, well-trained, and far better armed Mughal soldiers. Two Sikhs accompanied him. 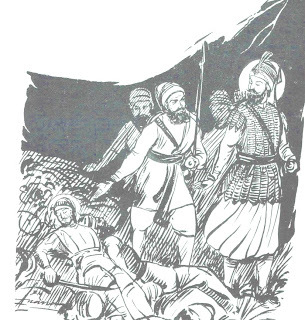 Baba Jujhar Singh fought as valiantly as his elder brother had done. Many mighty soldiers fell under the sword of the child-warrior. Then he was overpowered. The Guru had been watching and admiring Baba Jujhar Singh's wonderful performance. When he fell, the Guru thanked God that his second son had also proved worthy of His cause. The gate was attacked and defended in this way throughout the day. At night the Mughal army lay down to take rest. By then, besides the Guru's two sons, three of his five Beloved ones had been killed. Their names were Bhai Mutikam Singh, Bhai Sahib Singh, and Bhai Himmat Singh. Thirty two other Sikhs had also fallen. Only ten Sikhs were left with him. The Guru was left with no alternative. He had to obey the Guru Khalsa. He seated his five Sikhs near him and proceeded to entrust the Guruship to them. Then he said, 'After me the Khalsa Panth shall be the Guru under the guidance of Sri Guru Granth Sahib Ji. Whenever five Sikhs assemble and remember or call me, I shall be with them. Saying this, the Guru went round them thrice. Then he laid his plume and crest in front of them, gave them his arms, bowed before them, and said aloud, ‘Waheguru Ji Ka Khalsa! Waheguru Ji Ke Fateh!! The Guru Khalsa further decided that three Sikhs – Bhai Daya Singh, Bhai Dharm Singh, and Bhai Man Singh should accompany the Guru. Two Sikhs- Bhai Sant Singh and Bhai Sangat Singh – where to remain in the haveli. They were to hold it as long as there was breath in their bodies. The Guru said, ‘The idea is good. You have my permission, but on one condition, you should first cover the bodies of my thrity five martyred Sikhs. They are my sons in spirit and equally dear to me. 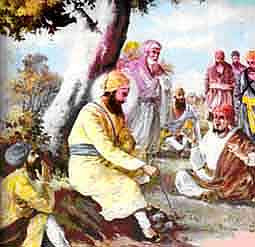 After that you may cover the bodies of these two martyrs, who are my son in flesh.’ Bhai Daya Singh could make no reply. He bowed and held his tongue. They then proceeded on their risky course. "It matters little if a jackal through cunning and treachery succeeds in killing two Lion's Cubs, for the Lion himself lives to inflict retribution, on you." Sri Guru Gobind Singh Ji addressed his followers thus have sacrificed four sons for the survival of the thousands of my sons who are still alive. You are wrong if you think I had only four sons, I have thousands of sons and daughters and in them I see the four I sacrificed. Those four sons were four virtues from Waheguru Ji, their body parts were to be smashed so that those virtues could be poured into the Khalsa.